With more than 200 million blogs publishing 80 million posts per day, Tumblr is one of the most widely used social platforms in the world. While there’s tremendous success stories attached to the network, Tumblr has stayed well below the radar for many brands. Tumblr is artistic, visual and a little on the weird side. It’s different from traditional blogging platforms like WordPress because it has a very strong social component. According to Neil Patel, co-founder of KISSmetrics, Tumblr is a social network that happens to have a blogging platform. So how do you know if using Tumblr for business is right for you? Let’s take a closer look at the hybrid platform’s demographics, as well as some of the pros and cons of incorporating Tumblr into your digital marketing strategy. Although Tumblr doesn’t have as many monthly users as some of the other social networks, that doesn’t make it any less valuable to brands. Tumblr’s users are young and engaged, making it a very compelling asset to businesses trying to reach millennials. Data released by GlobalWebIndex in 2013 showed 34 million Internet users contribute to or use Tumblr on a monthly basis. Nearly half of those users are between the ages of 16 and 24. Since 2013, Tumblr’s user base grew exponentially and the site even overtook Instagram as the fastest growing social platform in 2014. The hybrid platform now boasts more than 420 million users with 206 million registered blogs. And visitors are spending a lot more time on the site with an average of 28 minutes per visit. Here are some more recent demographic insights from Pew Research Center. 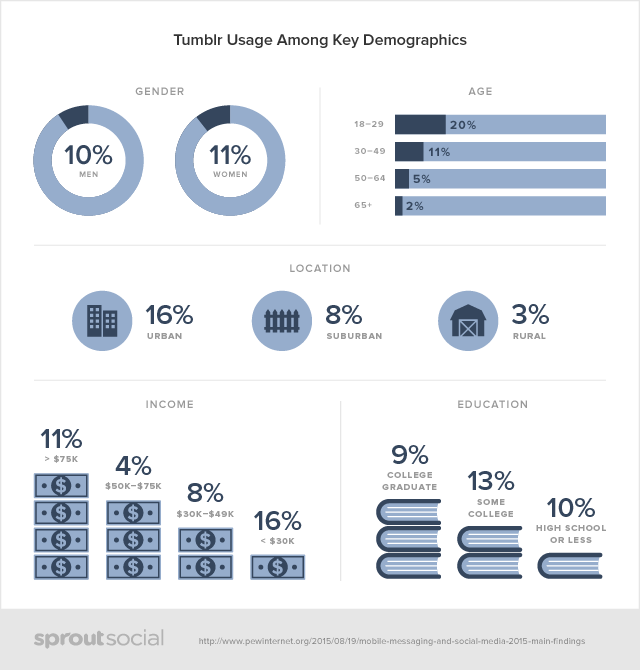 The young demographic is the driving force behind some brands’ decisions to increase their use Tumblr. For example, in 2015, Nescafé became the first global brand to move all of its international and local sites to the Tumblr platform. The new global Nescafé Tumblr platform allows fans to share images, videos, GIFs and other coffee-related content. But before Nescafé’s migration, several other brands have found success hosting part of their online presence on the microblogging site. Denny’s is a shining example. Unlike Nescafé, Denny’s only migrated its blog and still maintains Dennys.com, but that doesn’t seem to be affecting the fast-food chain’s success on the platform. Denny’s Tumblr presence is a bit bizarre, but then again so is the platform. The company regularly features graphics and animated GIFs that are usually breakfast themed. For example, there’s an animated GIF of what appears to be a yeti mixing eggs, and a picture of kids playing in a fort made of breakfast foods instead of blankets. The content is strange, but it works. It doesn’t feel forced or corporate, and it speaks in the same weird, visual language of Tumblr users. Because of Tumblr, Denny’s has kept users engaged, encouraged reblogging and the company even posts users’ fan art on the site. 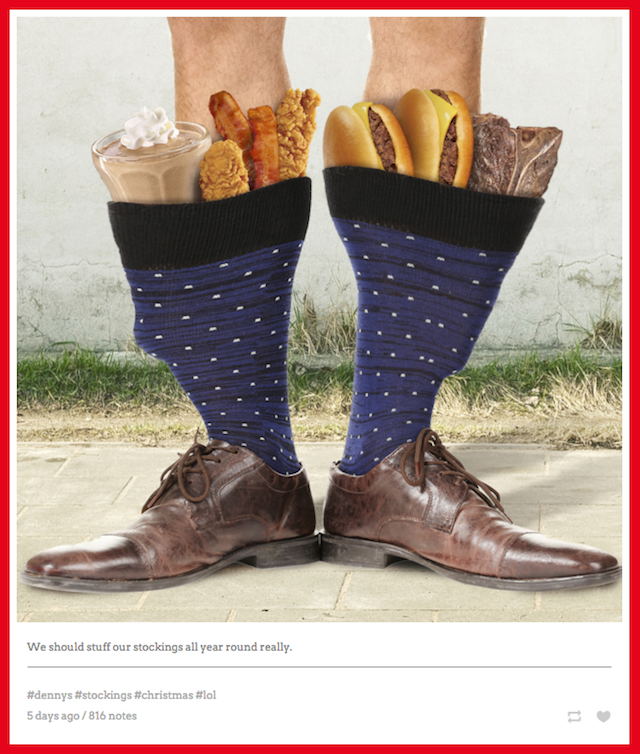 What makes Denny’s social strategy such a success is that it’s consistent across channels. Although the company might tone down the weirdness a bit on other platforms, its content is still unique to the brand. So when you come across a GIF of tongue turned into an escalator for food, you’re not all that surprised because you’ve already been exposed to the creative strangeness the brand has to offer. Here are a few things to consider when crafting your content strategy for Tumblr. Do have fun with your content. If there was ever a time to cut loose, it’s on Tumblr. Do experiment with different types of media, such as images, GIFs, videos, quotes and audio clips. Do use tags to manage expectations. Tagging posts helps people find your content and those who aren’t interested steer clear. Don’t go too off-message for your brand. Anything you say, even if it’s silly or weird, needs to fit your brand’s identity. Don’t force it. 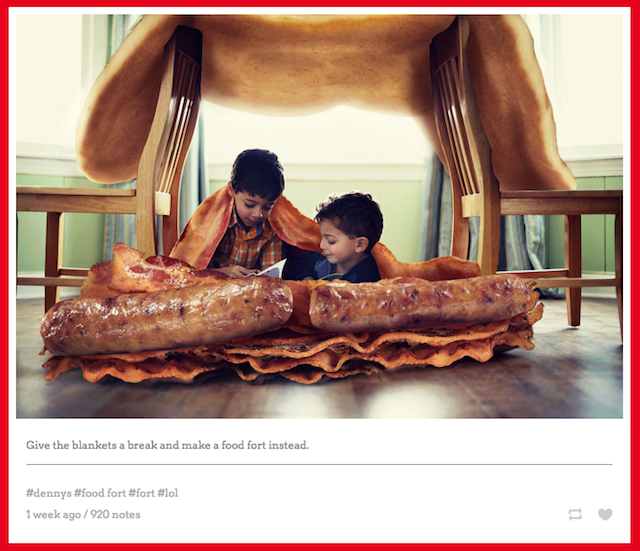 No one is surprised to find a yeti or tongue escalator on Denny’s blog, but if you haven’t dabbled with bizarre content before, shocking your audience is a good way to have your marketing campaign backfire. Don’t only rely on humor. Humor works really well on Tumblr, but you don’t have to be funny all the time to use the platform. Although the blogging platform itself creates a unique opportunity to engage fans, Tumblr offers additional tools to help expand awareness for your brand. Want to give your posts a massive head start on engagement? Sponsored Posts are just like regular Tumblr posts, except they’re much more visible. They’re also targetable by gender, location and interest. For additional reach, Sponsored Posts can be syndicated to Yahoo. Half of Tumblr users interacting with Sponsored Posts looked up the company after the interaction. Three out of five Tumblr users thought Sponsored Posts were a great way to engage and highlight content. You can test multiple creative approaches here as well, and Tumblr will narrow the campaign down to the one that performs best. You’ll only pay for the re-blogs, Likes, follows or clicks made directly from the Sponsored Post itself. The online fashion retailer ASOS, for example, designed a paid media campaign around a t-shirt contest on Tumblr. The company wanted to deepen connections with influencers and engage creators in the fashion and design communities. To do so, ASOS asked artists on Tumblr to design a shirt the company could sell in its store. The contest was publicized using Sponsored Posts and ASOS received 900 designs. That was narrowed down to four, and within 10 hours, they were sold out. Video is taking over content streams everywhere, so additional support is necessary to help marketers be successful in their campaigns on Tumblr. Available for the Web and mobile. In stream, videos play automatically and loop continuously. The player pops out so people can continue watching while they scroll. Tumblr’s Sponsored Video Posts are targetable just like regular Sponsored Posts, and come with additional analytics on views, looping and engagement. A major auto maker used Sponsored Video Posts, rather than pre-roll advertising, as part of its video content marketing strategy. 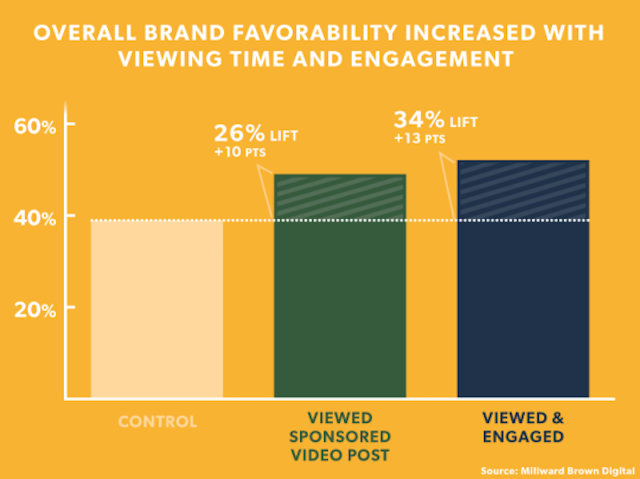 As a result, the brand saw a 34% lift in overall brand favorability among engaged users. Tumblr’s Sponsored Day tool lets brands own a day with a cross-platform promotion. This allows you to pin your logo and tagline to the top of the dashboard for 24 hours. It links to an exclusive tab in the Explore page—one of the most trafficked and engaging pages on Tumblr. The tab is filled with content you’ve selected, including your own posts, re-blogs of posts you like or a mix of both. The ad is very subtle in presentation, denoted only by a dollar sign icon as seen in Nike’s example below. Nike used this feature as part of its “Embrace your uncomfort zone” campaign. Desktop viewers were able to click through the Sponsored Day ad to watch a video for the company, while mobile users saw a static image. This chart shows the effect of engaging with the dashboard banner and then engaging with content on the explore page. 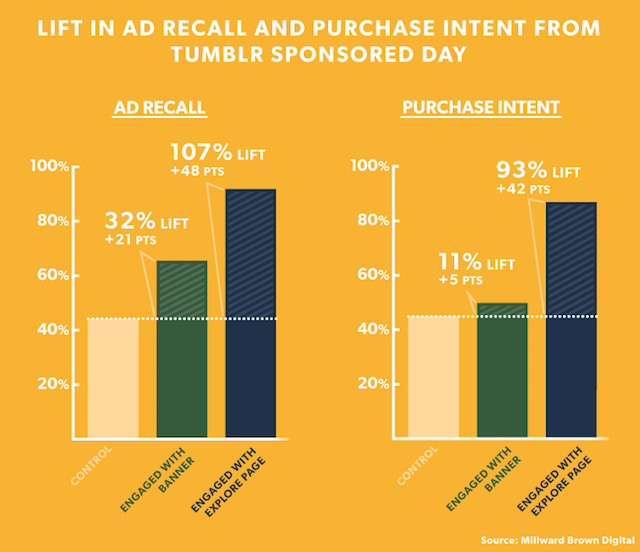 The chart shows that purchase intent and ad recall among the most engaged users was two times higher than the control group. Tumblr recommends that you don’t put your slogan on the dashboard placement. Instead brands see the greatest return when users engage with content on the explore page, so a clear call-to-action is ideal. The ad goes live at midnight EDT daily and can be purchased for global or country-specific exposure. It’s charged at a cost-per-thousand rate. For more details on Sponsored Day ads, contact your Tumblr brand strategist or email sponsors@tumblr.com. To better understand how your sponsored content is resonating with users, track your performance with Tumblr’s Advertiser Analytics. Although this feature looks at both paid and earned engagement, it’s only available to advertisers. If you’re an advertiser, you can access it by clicking Analytics in the right column of your Dashboard. There you’ll get a complete look at the way your content is performing on the platform. If you’re not an advertiser, but would still like to know how your Tumblr content is performing, you can sync your Tumblr blog with Google Analytics. 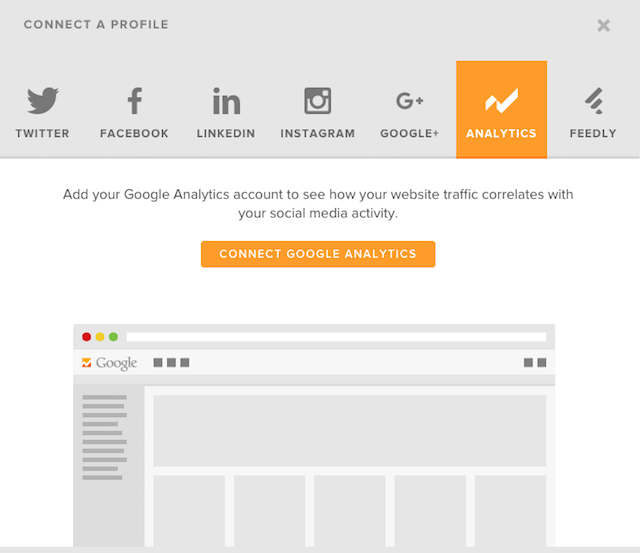 Then link your Google Analytics data with a tool to manage your social media—like Sprout Social—to create a more holistic social media and marketing monitoring experience. Tumblr isn’t a standalone marketing tool. It might be a hybrid platform, but it should still be used in conjunction with other social networks. A presence on Tumblr should bolster your overall content strategy and showcase a more laid-back side of your brand. And as we said earlier, Tumblr is primarily used by a younger demographic. If millennials are your focus, and you have a strong content strategy, then it’s worth devoting some time and creative energy to Tumblr.